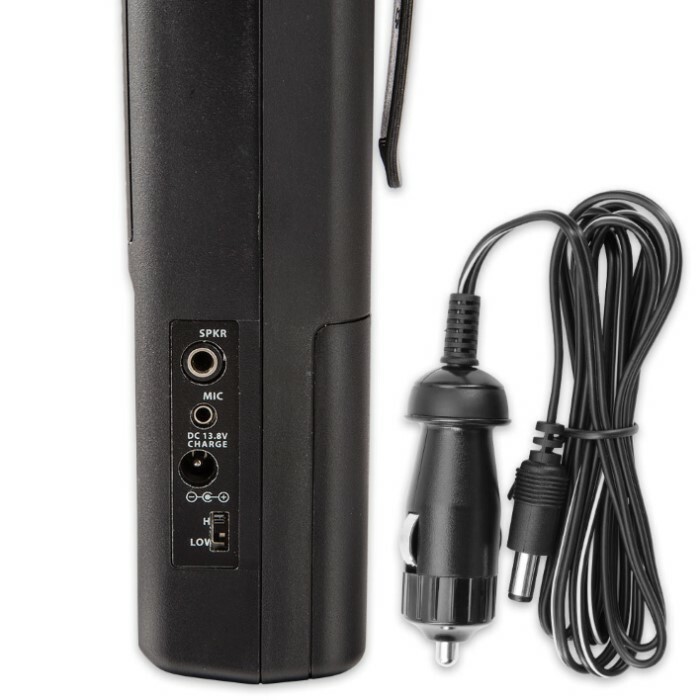 Uniden PRO401HH Hand-Held 40-Channel CB Radio | BUDK.com - Knives & Swords At The Lowest Prices! Don't let power outages, emergencies or back country adventures far from cellular towers sever your lines of communication! 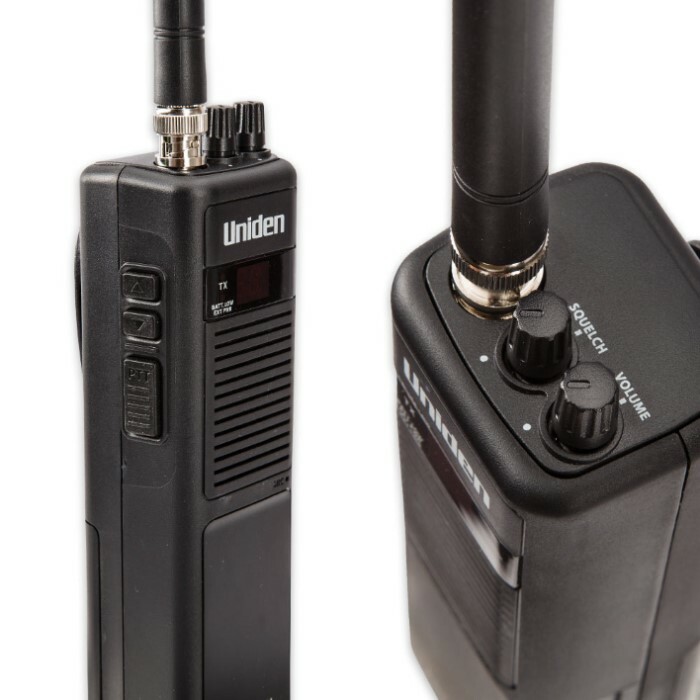 The hand-held PRO401HH CB Radio from the communication technology experts at Uniden offers a tried and true alternative to often-fickle cellular coverage that's just plain fun to use! Portable yet powerful, the PRO401HH is ideal for road trips, camping, hiking, biking - you name it! It's also perfect for anyone who wants to keep a CB handy for roadside or other emergencies, occasional business use or just for fun without permanently installing a CB unit in his or her vehicle. Just toss it in a glove box, center console or any other location that can accommodate its compact 7" high x 2" wide x 1 1/2" thick profile. It's also fantastic for home use! But don't let the PRO401HH's compact form (or affordable price) fool you - Uniden refused to sacrifice features and performance in its quest to engineer an ultraconvenient hand-held CB radio. Just like the "big boys" (i.e. permanently installed CB systems) the PRO401HH boasts 4W RF power for maximum legal transmission range, full 40-channel operation, a built-in condenser mic, TX indicator, squelch and so much more! For extra volume, clarity and comfort, plug an external mic and/or speaker/headset into the PRO401HH's handy audio jacks. The PRO401HH lets you enjoy all these amazing features and more for hours, thanks to its multiple power options. It operates on either DC power via the included adapter or nine AA batteries (not included) - alkaline or rechargeable. Just flip the switch inside the battery compartment to "alkaline" or "rechargeable," depending on your chosen battery type. The PRO401HH even features a "low power" setting for conserving battery life and a "high power" setting for extending your range when desired. 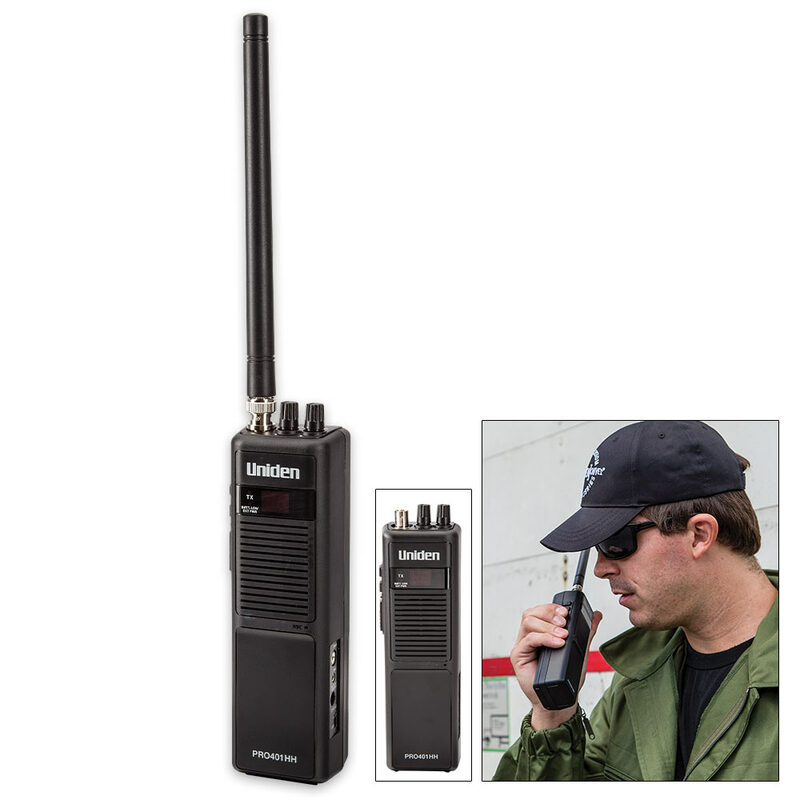 Whether you're new to CB radios and want an inexpensive, easy-to-use unit to test the waters, or if you're a veteran to radio "ragchew" and want a powerful yet affordable radio you can take with you wherever you roam, Uniden's remarkable PRO401HH Hand-Held CB Radio is the perfect solution! Integrated belt clip, DC vehicle power adapter, removable 8" BNC "rubber duck" antenna and instruction manual. Batteries NOT included.